A photo frame stand. Easy print and you can scale it to suit a bigger or smaller photo. Picture frame shown is 225mm X 225mm by 15mm. 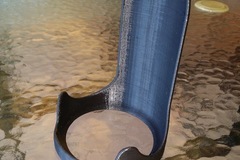 This one printed in PLA 0.1 or 0.15 mm layers and 1.2 mm walls.